College is an exciting time of change and personal growth. As you step into the college world, you begin to experience a whole change of life. College life is not easy because you are constantly being challenged by everything around you. You will deal with the ups and downs of college life. College is not only a place you learn and develop practical skills to help you find the right job but also a place where you develop a set of skills that help you in your personal life in the future. You learn the right skills to tackle the difficult life situations outside the campus. 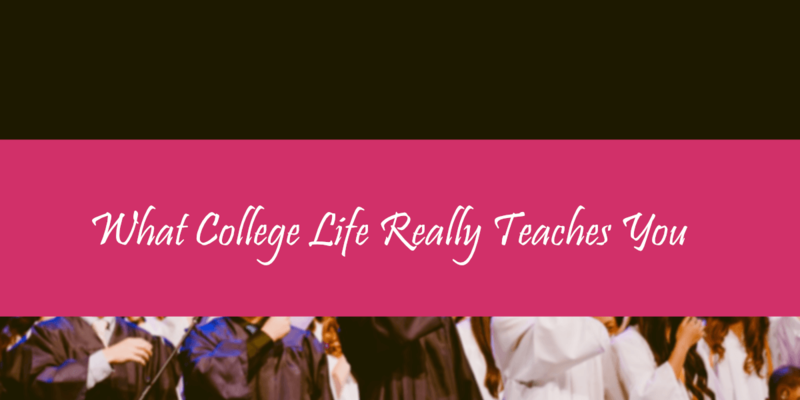 Here are five important aspects of college life that will teach you in real life. Perhaps you major in biochemistry but find that bioscience is what you should major in. Don’t feel guilty to change your major. After all, you are the one who will live by it. However, it is important to consider all the career possibilities that you will achieve later. Don’t hesitate to ask student advisors, family or friends for advice if you need to. Making mistakes is how you learn. Mistakes give you powerful lessons that you can learn from. For example, you may have chosen the wrong program. And few months into the program, and you have realized that the program was not really aspired or you aren’t interested in making it as a career. A long the line you find your passion in a completely different program of study, and that will make you change your program. That’s okay. It may be better for you. Your passion may lead to a rewarding career in the future. College life can be stressful. You deal with a lot of things inside and outside of campus. You may sometimes feel lonely being away from family, but friends will cheer you up. Try to find friends with whom you have a lot in common. Having great friends will help you find a way when you are feeling lost. Having a lot of school assignments is a typical college life. It can be very overwhelming but don’t get worked up easily with the pressure involved in school works. Sure, you are bound to meet deadlines and keep your grade up but don’t force yourself. There is a time you need to be relaxed and stay away from all of the stressful situations. So instead of spending all of your time focusing on academic life, you should spare some time for yourself. You can go out at night with friends to see a movie or go on a trip for the weekend. You need “me time” to reduce your stress. Unless you are studying professional programs such as medicine, law, M.BA, or Engineering, your degree may not be the ultimate determination of your future success. Many people who were college dropouts or never went to college have gone to have a successful career and become a billionaire. Of course, that does not mean you should drop out. The important thing is to continue learning and building as much experience as you can. It is you that will determine your success, and education will help you a long the way. College is not only a place where you learn the knolwedge for future career, but also a place where you will learn valuable life lessons for your future. It’s a lifetime investment.